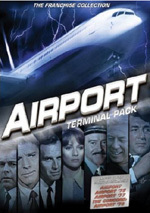 Based on the novel by Arthur Hailey, the film starts on a snowy day at Chicago抯 Lincoln Airport, where general manager Mel Bakersfeld (Burt Lancaster) tries to deal with the problems caused by the inclement weather. This leads to tension with his wife Cindy (Dana Wynter), as she gets mad about his absence from their home and the charity events she constantly schedules. To aid in matters, he recruits maintenance engineer Joe Patroni (George Kennedy) to help open a clogged runway. Further concerns come from protests at the airport to stop the use of a runway that goes over residences. 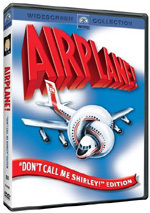 Bakersfeld also runs into entanglements with Vernon Demarest (Dean Martin), a pilot who officially complains about Mel抯 snow removal techniques. Soap opera elements emerge as we learn that Vernon抯 a philanderer married to Mel抯 sister Sarah (Barbara Hale) but he messes with plenty of other women such as stewardess Gwen Meighen (Jacqueline Bisset). The situation becomes even more complicated due to the presence of passenger Dom Guerrero (Van Heflin). He can抰 hold a job but tells his wife Inez (Maureen Stapleton) that he抣l find a way to fix their situation. To collect insurance, he plans to essentially commit suicide as he will detonate a bomb on board Trans Global Airline抯 flight to Rome, a plane piloted by Vernon. The rest of the film follows intrigue with this area and plenty of other subplots. 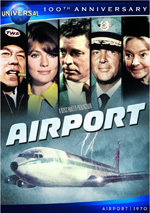 I recall seeing Airport on TV during the Seventies and feeling decidedly unimpressed. That was because it didn抰 deliver a lot of bang for the buck. It lacked the gaudy thrills of the average disaster movie, as it focused more on character drama than excitement. That made it less than captivating for a kid who just wanted to see some mayhem. Fast forward about 35 years, and one might hope that I抎 want more from a movie than simple fireworks. This may or may not be the case, but I do know that Airport seems no more satisfying to me now than it did in my childhood. I find it shocking that the Academy actually nominated this clunker for 10 Oscars. Extremely slow-paced, Airport greatly emphasizes the soap opera elements over the disaster parts. It definitely takes its sweet time to get going; the movie doesn抰 even introduce the concept of the bomb until about a fourth of the way into the movie. Many folks will probably applaud the flick抯 logy rhythms, as they might view the pacing as a nice contrast to the lack of exposition in modern films. I agree that too many stories tend to dispense with the appropriate levels of exposition, but in this case, eventually enough is enough. Airport goes on for so long with information that has so little relevance to the main story that it becomes badly tedious. A lot of the problem stems from the dull characters. They lack much pep, and that leaves it as little more than Peyton Place at an airport. With all its sexual innuendo and themes related to pregnancy and abortion, I抦 surprised that the film got a 揋� rating. All of those elements should add some zing to the movie, but the bland personalities drag down the tale and make it lackluster. Only Helen Hayes� Oscar-winning turn as an elderly, unrepentant stowaway prompts any signs of life in this dud. She plays Ada as charmingly devious. Sure, Hayes hams it up a bit, but she nonetheless offers the only lively parts found in this leaden, overly serious flick. Airport appears in an aspect ratio of approximately 2.35:1 on this Blu-ray Disc. While not a great presentation, this was a satisfying transfer. Overall sharpness appeared good. Occasional shots came across as a bit soft � usually wide interiors � but most of the movie showed appealing accuracy and delineation. I noticed no concerns with jaggies or moir� effects, and I think noise reduction remained minor. Although I suspect techniques were used to zap some grain, the effort still seemed pretty 揻ilm-like�. In terms of print flaws, I noticed a couple of small specks but nothing more. Colors tended to be somewhat flat. They usually looked fairly natural and occasionally bordered on lively, but the film抯 drab visual design meant the hues stayed with neutral tones that appeared less than dynamic. That was a photographic choice, though. Blacks were nicely deep and tight, while shadows demonstrated pretty good delineation. Low-light shots showed good clarity. Overall, I felt pleased with the transfer. Given the age of the film, I didn抰 expect much from the DTS-HD MA 5.1 remix, and I got the kind of limited production I expected. Music benefited the most from the multichannel capabilities. The score demonstrated nice stereo imaging in the front, and the rear speakers gently echoed the music. Effects mostly stayed centralized. Some general ambience occurred along with occasional localized elements, but don抰 expect a lot of fireworks. Vehicles sometimes moved from one spot to another, and plane ambience was decent. Even sequences like the explosion lacked much breadth. This was a 揵road mono� mix for the most part, as it opened things up in only a minor way. Audio quality was acceptable for material from 1970. Speech showed a smidgen of edginess and could be somewhat brittle, but the lines remained intelligible and clear. Effects were clean and occasionally showed good low-end, mainly in scenes connected to planes. Music worked best, as the score was reasonably rich. High end tended to sound a bit shrill, but it offered pretty nice bass. Though it didn抰 excel, it presented the strongest portion of the mix. All in all, I heard enough here to warrant a 揃�. How did this Blu-Ray compare to the 2004 DVD? Audio was a little bolder and cleaner, while visuals showed improved clarity and definition. Across the board, the Blu-ray delivered a stronger presentation of the film. In addition to the film抯 trailer, we get two featurettes under the banner of 100 Years of Universal. 揟he �s� goes for 11 minutes, one second as it provides notes from filmmakers Peter Berg, Steven Spielberg, John Landis, Peyton Reed, Amy Heckerling, Ron Howard, Judd Apatow, Hal Needham, Ivan Reitman, and Stephen Daldry, writers David S. Ward and Bob Gale, former Universal executive Edgar Bronfman, Jr., journalist Geoff Boecher, and actors Russell Crowe, Ted Danson, Paul Rudd, Dermot Mulroney, Danny DeVito, and John Krasinski. 搾70s� discusses The Sting, American Graffiti, The Jerk, Smokey and the Bandit, National Lampoon抯 Animal House, and Jaws. In 揟he Lot�, we get a nine-minute, 25-second piece in which we hear from Spielberg, Rudd, Reed, Reitman, Berg, Landis, Howard, filmmakers Michael Mann, Phil Alden Robinson, and John Carpenter, NBC Universal Archives and Collections director Jeff Pirtle, Universal Studios Hollywood tour guide Molly Orr, and actors Dan Aykroyd and Meryl Streep. This one takes us around the Universal Studios locations and tells us a little about movies made there. What does any of this have to do with Airport? Very little. Midway through 揟he �s�, we get a quick snippet from the film but that抯 it; no one discusses it at all. Despite the featurettes� disconnect from Airport, they抮e both pretty fun. While they aim to promote the greatness that is Universal, they抮e still light and likable. The package also includes a DVD Copy of Airport. Because I rented the Blu-ray, I can抰 say if this is a standard retail version. Nonetheless, I wanted to mention that if you buy the Blu-ray, you get the DVD as well. While Airport launched the disaster flick boom of the Seventies, it doesn抰 stand as one of the genre抯 more interesting releases. Indeed, I think it抯 probably one of the most boring examples of this kind of movie, as it pours on too much soap opera and too little action or intrigue. The Blu-ray offers pretty good picture and audio but lacks substantial supplements. Despite the absence of significant bonus materials, this becomes a positive representation of the film.